To make aioli, zest lemon and stir in with other ingredients in a small bowl. Store in the fridge until needed. For slaw, stir together oil and vinegar in a small bowl. Then add salt and pepper and stir in all the sliced or shredded ingredients. Stir well to combine and then store in the fridge until needed. To start chickpea veggie burgers, add water and chickpea flour to a small pot and heat over medium-low heat. Stir constantly to make sure the flour is evenly mixing and isn't sticking to the pan. Once the paste has cooked for a few minutes, stir in spices, whole chickpeas, and herbs. Kill the heat. Once cool, shape the chickpea batter into 6 evenly sized patties and drizzle each patty with some olive oil. When you're ready to cook the patties, get a pan hot over medium-high heat. Add a drizzle of oil to skillet and add the patties. Cook for about 5 minutes per side until they are lightly crispy on the outsides. Alternately, you can cook these on the grill if you are careful. Just set them on a very hot grill and carefully flip them once after 4-5 minutes of cooking. To make a sandwich, toast your bun or kaiser roll and smear on some aioli. Add a handful of greens to the bun and then add a chickpea patty. 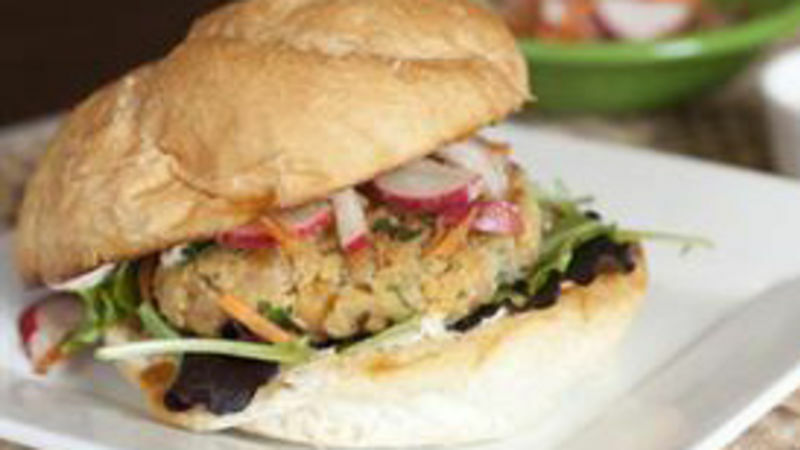 Top the patty with some of the carrot slaw and your sandwich is done! I’ve been on a bit of a hunt (okay, my entire life) for the perfect veggie burger. I’ve yet to find a store-bought veggie burger that I think is truly exceptional. A fair number of them are okay, but I like my veggie burgers to have lots of flavor and texture. So normally, that means I need to make them myself! It’s hard to rank veggie burgers, honestly, because a lot of them are really different. That said, I would rank this spicy chickpea sandwich in my top five of homemade veggie burgers. What I love about this burger is that it uses whole chickpeas that have a great texture. The burger also uses chickpea flour as a base, which gives the whole burger a really deep flavor. If you’ve never used chickpea flour before, you can usually find it near the flours in your grocery store. It’s literally just ground up dried chickpeas. You’ll want to check the cooking instructions on whatever kind you find as they might vary slightly, but it will most likely say to mix one cup of the flour with 1-1 ¼ cups water. So just add the flour and water to a small pot over medium-low heat and stir it constantly. After a minute, it’ll form a nice paste. Just keep cooking and stirring this for a few minutes until it gets really thick. If it gets too thick and starts to stick to the pot, add some extra water. Once the paste is thick, stir in the spices, whole chickpeas, and fresh herbs. This is where all the flavor comes from. Once your base is mixed, you can take the pot off the heat and let it cool so it’s easier to work with. Once the mixture is cool, just use your hands to form six evenly sized patties. Once you have them formed, go ahead and drizzle them all with a bit of olive oil. Besides the delicious patties, there are two parts to this sandwich that really take it to the next level. The first is a simple aioli that mixes in some spicy cayenne and lemon zest. The lemon zest is really key. The citrus makes all the flavors pop. Feel free to go heavy on this stuff when making your sandwich! The third part of this sandwich is a crunchy carrot slaw. You can even buy pre-shredded carrots which makes this even easier. When you’re ready to cook the patties, heat a large skillet over medium-high heat and add some oil to the pan. When it’s hot, go ahead and add in your patties. Cook them for about 4-5 minutes per side until they are lightly browned on each side. You can cook these on the grill, but just make sure the grill is very hot and only flip them once as they are a bit fragile. When you’re ready to make a sandwich, toast your bun and slather both sides with the lemon aioli. Then pile on some mixed greens and a chickpea patty. Top the whole thing with some of the crunchy slaw and your sandwich is done. I love a good beef hamburger as much as the next guy, but this burger is really flavorful and plenty filling for me. Give this a shot if you’re looking for something healthier than a hamburger but still in hamburger form! Nick thinks it’s important to remember that just because something is healthy doesn’t mean it can’t also be delicious! Check out his blog, Macheesmo, and follow him on his Tablespoon profile.